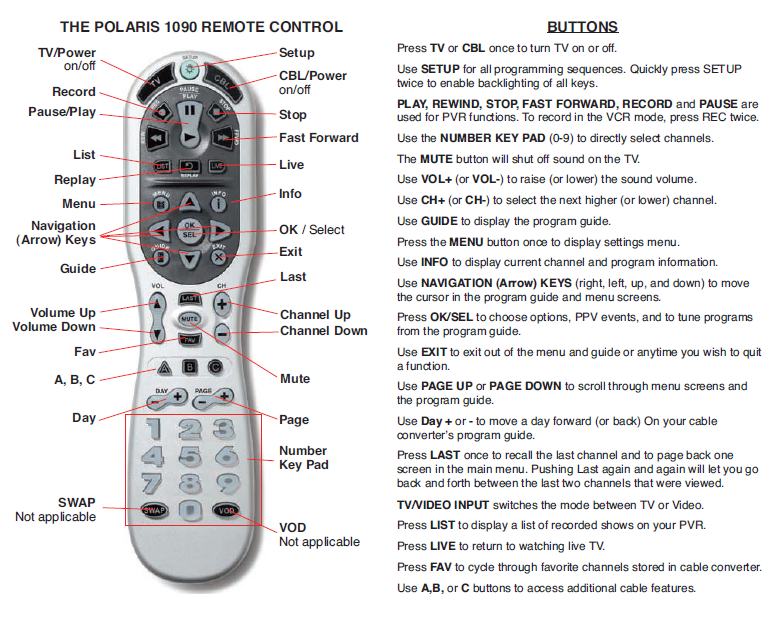 Please follow these directions to program your TV to this new remote control. This remote control is already pre-programmed to control your Set Top Box (STB). The instructions below will program this remote to control your TV. Then press Channel Up button slowly and repeatedly until your TV turns o. Basically, this means that you can transfer the information from the FACTORY ISSUED remote to the ADB remote (power, volume, etc.) It bypasses having to do the code search method. Place the ADB remote and the ORIGINAL remote head-to-head about 2 inches apart. Press and HOLD the SAME button (power) on the ORIGINAL remote. The ADB remote TV button will blink rapidly and turn off. Keep holding the button on the ORIGINAL remote until the TV button on the ADB remote blinks twice. *if the learning failed, the TV button will emit on long blink. You will have to repeat step 6. Use the following steps to allow the ADB remotes to turn on/off the TV while in Set Top Box (STB) mode. This should eliminate the need to toggle between TV mode and STB mode. You can determine what mode the remote is in as the LED mode light will flash when any button on the remote is pushed. NOTE: With this setup, ONLY the TV power (on/off) will be controled using the remote while in STB mode. The STB power will have to be toggled on/off by pushing the power button located on front panel of the STB. On the Remote Control, press the TV button once; it blinks once. Then press and hold SETUP until the TV button blinks twice. Aim the remote at the TV and press the TV button once. Continually press and RELEASE CH+ until the TV turns off. Stop when the TV turns off. NOTE: In the search mode, the remote control sends IR codes from its library to the selected device, starting with the most popular code first. If the TV does not turn back on, slowly press CH- until the TV turns on. Press SETUP once to lock in the code. The TV button blinks twice.